Before I start talking about the case itself, I’ll share a brief tale. I ordered a ZÜCA Pro bag via Amazon.com in mid-December. Ace Photo Digital was to fulfill the order and the estimated range for delivery was between December 17 and 22. The shipment did not arrive on the 22nd and I had to leave that evening because I flew out of Tampa for Alberta early the next morning. For the brief time I was back in Orlando after the Alberta trip, I stopped by my office Saturday night, January 3, and found that the mail room workers had left the box on my chair. I checked the tracking number to see what day it actually arrived, and the UPS site was unable to reveal anything. It seemed the tracking number was invalid. The next day, Sunday, I flew to San Francisco for Macworld, this time with the ZÜCA case. It wasn’t until my return a week later that I called UPS for help. The representative actually managed to figure out the correct tracking number based on my Amazon.com order number, and I learned that Ace Photo Digital did not ship the bag until December 22—the last day of the delivery estimate range—and that it arrived at my office December 29. Ace Photo Digital has not responded to my messages asking for a refund of the expedited shipping I paid for, and I have filed an Amazon A-Z Guarantee claim in the hopes of being refunded the difference. Update – Jan. 20, 12:30pm: Amazon has processed my claim and I did receive a refund of the difference between standard and expedited shipping. The shipping experience notwithstanding, as it turned out I probably wouldn’t have been able to use the ZÜCA during my Alberta trip anyway due to the amount of luggage I needed to carry, but traveling with it to San Francisco was a much different story—details to come in just a bit. I am at a complete loss where I first learned of Zee-Ultimate Carry-All (aka ZÜCA) travel case. Whatever the circumstances where, I was immediately intrigued. I frequently take short trips and loved the idea of a travel case that permitted easy organization of my clothes and was easy to move around. More impressive is that the ZÜCA Pro is specifically designed to fit in the overhead storage bins of most airliners, as well as easily roll through the aisle between seat rows. Note, the same is not true for the ZÜCA Sport which is intended to meet the needs of a completely different customer. Where the ZÜCA Pro is ideal for short business trips, the ZÜCA Sport dimensions don’t fit all airline storage bins, and instead of the zippered pouches that come with the Pro model which are ideal for storing clothes, the Sport version appears to come with an open space that is well suited for student supplies, sporting gear, or even transporting a small pet—all depending on which insert is fitted into the Sport frame. For my trip to the Macworld Expo in San Francisco, packing everything into just the ZÜCA and my backpack meant, for the very first time, I was able to fly with only carry-on luggage. Considering my luggage didn’t make the connecting flight on my return from Alberta and it didn’t get to me until the next day—barely enough time to wash and re-pack for my San Francisco trip—not having to worry about checked luggage was a thrill. Yet, getting everything for a full-week trip to fit in just these two bags was a logistical challenge. I managed it, but having done so confirms that the ZÜCA is probably best suited for a trip lasting no more than an extra long weekend—not a full week. Fortunately, long weekend trips are reasonably common for me. Granted, airlines aren’t frequently involved for such trips, but the ZÜCA is a great case regardless what means of transportation is being used. As the web site indicates, the ZÜCA Sport is only 8¾ pounds. Its combined L+W+H dimension is 42 inches which is within the Federal Aviation Agency’s requirements for carry-on items. The width easily passes between airliner seats, and, when laid on its side, slides perfectly into overhead storage bins. As stated above, I did not have this case during my Alberta trip, but based on how my backpack fit in the overhead bins, I’m pretty sure the ZÜCA would have fit even in the small commuter plane I took from Denver to Edmonton. Five zippered pouches slide in and out of the main storage space of the case. The pouches are various sizes, designed to accommodate different types of clothes and other items. In addition, there is a one-quart transparent pouch that fits in a netted space at the top of the ZÜCA intended to store toiletries. Simply fill this pouch with containers of shampoo, soap, toothpaste, etc. that are 3 ounces or less, and airport security gates shouldn’t give hassle to anyone. The wheels for rolling the case by means of its 41-inch telescoping handle are, by no means, chintzy pieces of plastic found on most suitcases. These polyurethane wheels look as though they’d give professional inline skate wheels a run for their money. They are also recessed into the design of the case and don’t stick out very far, which means they won’t take up extra room when sliding the case into a narrow storage bin. One of the coolest and most unexpected features is the design of the aluminum alloy frame. ZÜCA engineers managed to create a frame that keeps the entire case light, yet can support 300 pounds of weight. That means an owner can use it as a seat, and believe me, I did! At two different connecting airports, I made my way to the departing gate and found no empty seats in the waiting area. So I simply collapsed the pull handle and sat right on the ZÜCA. In spite of being made of aluminum metal, it really is not all that uncomfortable, especially when I positioned the case against a wall to use as a back rest. Granted, I wouldn’t want this case to be my seat for the duration of a flight, but for perhaps a half-hour wait to board a plane, no problem. ZÜCA sells a wide selection of accessories to go along with their cases. If the thought of sitting on the hard metal frame is not appealing, a fitted cushion is available, as well as extra storage pouches and replacement wheel, including wheels with flashing LED lights. Even though my backpack rested fairly well on top of the ZÜCA and against the handle while dragging behind me when walking, I’m considering looking at the ZÜCA Backpack. I’ll need to do some checking first, but it appears as though it may hold as much (or more) than my current backpack, and is designed to perfectly complement the case. It includes straps that wrap around the telescoping handle and keep the backpack from sliding off. Business travelers may be wondering how to store their slacks, shirts, skirts, blouses, etc. in such a confined space without causing a lot of wrinkles. ZÜCA has you covered there. In one of the outside pockets, every case includes an instruction card on how to pack clothing in a way to minimize wrinkles, and I can tell you that it works. The trick is essentially to fold just the sleeves of a shirt back, or fold pants in half once, and no other folds, Then, roll the garment into a tube that lays neatly in one of the pouches. Granted, I did not take any dress clothing on my trip to Macworld, but I was able to fit two pair of jeans plus a tee shirt into the two largest pouches, four more tee shirts in the next size down, and all my other personal items in two small pouches, plus my toiletries in the clear plastic container. ZÜCA specifically recommends wearing whatever you can onto a plane such as dress coats, shoes, etc. However, if I were only traveling for a day or two, I could easily have placed a second pair of shoes into one of the two largest pouches instead of pants. At $285, the ZÜCA’s price may put it slightly out of reach of a casual traveler, but I can authoritatively confirm that this case can hold as much as mid-range suitcase that may cost just about as much money for a quality brand and possibly not even fit in airline storage bins. Even if you can find a suitcase that is a bit less expensive, the extra cost seems worth while when you factor the ZÜCA’s sit-ability and the possible elimination of ever having to deal with checked (and lost) luggage! For trips lasting no more than an extended weekend, the ZÜCA Pro gets ALBj.net’s seal of approval. For week-long (or longer) trips, the ZÜCA Pro combined with perhaps one item of checked luggage is a worthy compromise. Removable, washable, replaceable insert bag is made from water repellent ballistic nylon and coated with water repelling polyurethane. Previous story I’m at Macworld 2009! I purchased one of these to carry books to university. As I have mobility problems, I could use the packing pouches to carry all my necessary pieces of equipment and as it rolls along so well, I find it indispensible. The seat is also very useful because I find myself using this on trains when there are no seats or even in libraries when I can’t find a place to sit. Ditto for parks! 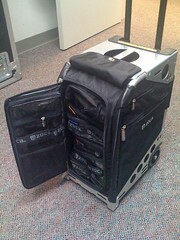 I highly recommend this case because it is very well built and you can organise your stuff very well. In addition to that, the seat comes in handy when you least expect it to. These days it is not unusual to see many professional people drag along trolleys to save their backs from taking the strain of carrying heavy equipment. Here in London, England, corporate city workers are regularly seen running around with trolleys, and I think this is a pretty good one to use. I had an old Targus trolley which was excellent but the Zuca is more convenient to use and has the added advantage of fitting into the overhead compartment of most planes. This case sees a lot of use. It is very sturdy and will last a very long time so it is definitely a worthwhile investment. I agree with this review and think this item is great for people who have health problems such as bad backs because you can put in all the heavy stuff and just roll it along. You can sit on it when you get tired and that is very useful when you are waiting for a train or bus. I think design-wise, these trolleys also look pretty cool. They are the perfect accompaniment for a hipster!